Our aim with SmartGuide is to make application development accessible to everyone, enabling organizations of all sizes to quickly build web or mobile apps, portals, chatbots, or breathe new life into legacy systems–even with limited technical resources. Drag-and-drop your way to great-looking applications. Easily position elements where you want, resize them and vary their appearance per device type. Apply advanced business rules using a powerful, yet simple, visual editor. Hit the ground running with accessible and responsive production-ready templates. Auto-create app components from PDF forms, XML schemas and web services. Benefit from a slew of built-in server and client-side functions and add your own when needed. Kickstart your development projects with prebuilt apps and components. Customize them to fit your needs to a T or build your own and reuse them across multiple applications. Every thing you build with SmartGuide has the potential for reuse! Slash your application backlog and your integration costs at the same time! Benefit from instant, no-code integration to CRM and database systems. Even integrate older systems using standard Java or .NET. Create compelling user experiences that tap into the rich personalization capabilities of your CRM system. Choose the CRM entities you wish to connect your apps with using a simple interface in order to create bi-directional connectors. Guide users through a data collection process and capture only the information needed. Behind the scenes, SmartGuide will seamlessly manage the storing and retrieval of data in addition to filling out the electronic equivalent of a form. SmartGuide natively supports the use of SOAP and REST web services, including OData. Either uploading a WSDL file or providing a sample call is all that is required to create a connection that can be reused across multiple applications. Build your applications once and deploy them anywhere. Avoid vendor lock-in and move seamlessly from one environment to another. Deploy applications on multiple devices from a single development effort. Choose among Bootstrap, Materialize and other presentation frameworks to bring your apps to life. Package them for deployment on the app stores or within your organization. Deploy SmartGuide in J2EE and .NET environments. Applications developed with SmartGuide can be deployed as Portlets, Servlets, Web Parts, User Controls or even as web services. No additional effort is required per deployment option. Deploy SmartGuide applications to your favorite Cloud provider. SmartGuide's low footprint helps you save costs–allowing you to comfortably deploy multiple applications on the same instance while still ensuring fast response times. Secure access to highly personalized applications, whether they were built with SmartGuide or not. Provide IT admins with more control over web application access and identity security. Ensure maximum security and control through identity management, encrypted sessions and audit trails. Provide fine-grained access using role and user-based claims. Benefit from additional security features such as two-factor authentication and 128-bit encryption. Reduce friction for end-users by providing them with a single sign-on (SSO) to access the different resources they need. Provide them with a streamlined process to access OAuth, Active Directory, LDAP and SAML-based applications. Give end-users the possibility to register an account, reset their password and manage their profile with SmartProfile. This SmartGuide add-on includes a full-fledged signup flow which can be entirely customized to your exact requirements. Is SmartGuide the right fit for you? The 311 Service Request app can be used from any device to report common problems like potholes, graffiti and lighting problems. This responsive, fully-customizable app includes features like geolocation, photo capture and notifications out-of-the-box. Request the removal of bulky items such as old furniture and appliances using any device (smartphone, laptop, desktop…). This responsive and fully customizable application also demonstrates the use of custom widgets for the selection of items. This application shows SmartGuide's ability to prefill Smartlet fields with data contained in external systems as well as SmartGuide’s support of complex and variable calculations. Fifty or so fields from 2 PDF forms are also dynamically populated. This chatbot automates the first part of a loan application by providing guidance and generating quotes that incorporate complex and variable calculations. Data is sent to an external system in addition to being used to dynamically generate a prefilled PDF form for local saving. 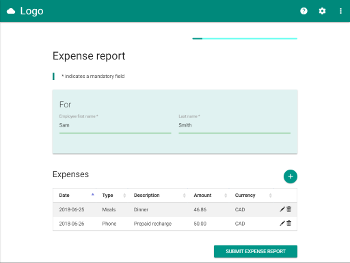 In this sample, the base currency is the Canadian dollar and any expense incurred in another currency is automatically converted using a REST web service. Additionally, the completed report is made available for download as an Excel spreadsheet and an approval request is added to a task management system (Asana). This fun tool shows how SmartGuide can be used to create educational applications such as this Lost At Sea team building exercise. In this exercise, you must rank items according to their usefulness in helping you and your team survive a disaster at sea. See how much you score and share the results via social media! This nifty tool provides an easy way for roommates and couples to divide bills based on their mutual incomes. The presentation layer is based on Materialize, the modern responsive front-end framework based on Material Design, one of the many frameworks that can be used with SmartGuide.